Pete Kuld played on into his eighth pro season in 1994 his second in independent ball. Speaking to The Los Angeles Times that September, Kuld explained why he continued. "I felt I was never given a real opportunity in minor-league ball," Kuld told The Times. "I'm wearing this uniform because I still want to play in the major leagues." 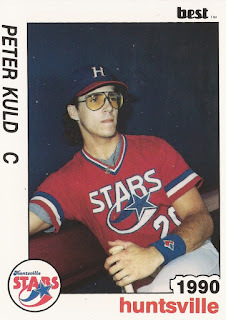 Kuld played a total of six seasons in the minors, making it as high as AA. He played a total of four in independent ball. He never made the majors - or back to the minors. Kuld's career began in 1987, taken by the Indians in the 13th round of the June secondary draft out of Pepperdine. Kuld is also credited by his full name, Peter Kuld. He started with the Indians at single-A Kinston. The catcher hit .185 in 35 games. He then moved to single-A Waterloo for 1988, then briefly returned to Kinston for the start of 1988. Kuld played the rest of 1988 at independent Miami and AA Huntsville in the Athletics system. He returned to Huntsville for 1990, then played 1991 between AA Wichita in the Padres system and AA Tulsa with the Rangers. He started 1992 back at Tulsa. He knocked three hits in an April game, including a bases-clearing triple. He hit .228 over 68 games that year, ending his affiliated career. Kuld arrived at independent Thunder Bay in 1993. He returned there in 1994 and 1995. He played his final season - his 10th - in pro ball in 1996 at Duluth-Superior. In spring 1995, Kuld made one more bid at affiliated ball and the majors through replacement ball. He told The Times that March the sting of seeing a dream seemingly end. "I've wanted to play major league baseball since I was 4," Kuld told The Times. "When they take that, they strip you of everything. You have nothing to go back to. You're lost."